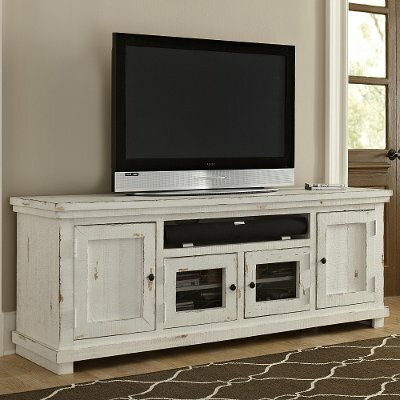 Dress up your entertainment area with this distressed white 3 piece rustic entertainment center from RC Willey, it is sure to look fantastic in your home. With space enough to accommodate most TVs, media storage space, display space and a cord management system, this unit has it all. When you sit down on your comfy couch at the end of the day and watch your favorite shows framed by this beautiful entertainment center, all will feel right. Get it today at RC Willey. For a rustic look in your entertainment area, check out this 74 inch distressed white pine TV stand from RC Willey. 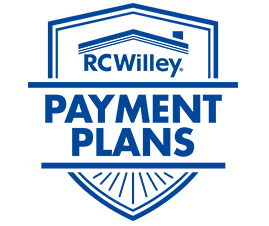 Large enough to accommodate most TVs, media storage space, and a cord management system, this unit has it all. When you sit down on your comfy couch at the end of the day and watch your favorite shows on this TV stand, all will feel right. Get it today at RC Willey.